Are you in the market for a swimming pool perfect for your family? Fiberglass is a popular choice amongst many families, offering loads of versatile options. If you want to splash around, play games, and more, your pool’s deep end is required to be 8-feet deep. 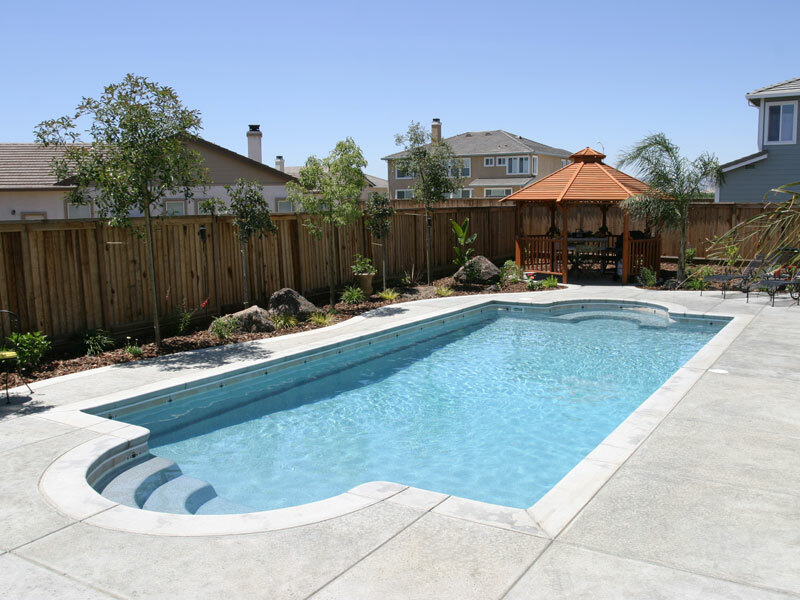 Educating yourself on the requirements of each are essential in selecting the perfect fiberglass pool the entire family will love. Use this guide to configure a pool that will suit all your family’s swimming needs. If your family is all about serving up the next game of volleyball, then you will want to consider a rectangle pool that is ideally 16×36, with your deep end depth 5-feet deep. You don’t necessarily need a rectangle pool, but it is the most ideal for finding accessories as well as playing. If your family lives, breathes, and only wants to play Volleyball, there are smaller Sport models that you may want to investigate as well. Note this option would limit the use of your pool. If your family is always playing around and having fun, then you might want to consider a rectangle pool that offers you a great deal of swim space. Dimensions of 15×30 and up in any shape will also do the trick. If you have young swimmers, or like to play games you may want to consider a maximum depth of 5-feet. This allows you to touch the bottom of the swimming pool while having fun playing games like Marco Polo, Sharks and Minnows, Basketball, Chicken Fighting, and more. If you’re looking to enhance your fun, considering a pool bench with your pool would be a great a spot for swimmers to take a break on, or use as a tool to escape their captor in a game of Marco Polo. An athletic family who is all about working on their fitness by swimming laps have made a great choice selecting fiberglass as their option. Families who want to do the spinning kick off the wall when they reach the end will want to consider a sim lane with nothing to obstruct their way. This means no benches or steps. Lengths and shapes are completely owner’s preference, but many pool professionals recommend a pool that is at least 35-feet long for doing laps. If you are only installing a pool for laps, a Sport model offers a jet resistance component for an additional cost. Have a yard too small for a fiberglass pool? Consider getting a swim spa so you can swim laps without the need for a swimming pool. If your family is all about diving to new depths and practicing their perfect 10, you may want to consider a pool with a depth of at least 8-feet. The diving well and ramp must be both be 13-feet long. Most fiberglass pools that are made for diving come in 40-foot lengths that are ideal to accommodate the diving code needs. You will want at least a 16-foot width. If you are a family who just wants to jump and slide at your leisure, then your pool size will depend on your family. Family of 4 will want to consider various sizes with a dimension of 14×28, while larger families will want to consider dimensions of 15×30. If your pool will be host to 6 or more on a regular basis, optimize swimming space with a dimension of 15×35. Note that you can accessorize your pool with a slide provided that it is 3-feet deep and 12-feet wide. It is possible that your family needs fall into one or more of these categories. You may want to consider a multi-purpose approach. At Elitepools.ca, we recognize every family has unique swimming pool needs. Contact one of our knowledgeable staff to help discern the best option for you and your family.